Finding pests in your home is less than ideal, but it happens to everyone! Whether you live in the bustling Sacramento area or you live on the outskirts of town where nature and open fields are more common, you’re dealing with pests. If you’re wondering what it is that’s attracting pests to your home in the first place, there are so many different things that it could be. Earthwise Pest Management has provided the Sacramento area and surrounding towns with long-term solutions to their pest control problems. In that time, we’ve discovered a few of the factors that attract pests to entering a home. Keep reading to figure out what it is that could be attracting pests to your home. The only way that pests can get in is if there’s an opening for them sneak through in. This is one of the main reasons that pests find their way into the home, so the first thing that you should do is look for any openings or cracks in your home. These could be as small as a rotted seal on a window or a weatherstrip that’s worn away. The more small entryways that you find, the more pests are likely to get into your home. When you notice that there is a crack around your door, in the siding of your home, or in a window screen, it’s best to go ahead and get it repaired as soon as possible. Doing so will immediately eliminate the number of pests that you’re going to see inside your home, and they will also help enhance the efficiency of your home. This is definitely a win-win for all homeowners to take advantage of. Life can get messy, and when you add factors like work, kids, pets and the like to the mix, it can get even more challenging to keep your home clean. 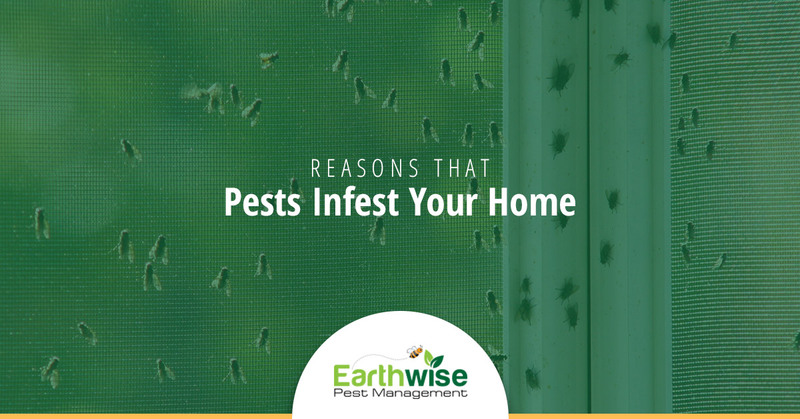 Unfortunately, one of the factors that attract pests to a home is a mess that can not only keep them hidden but provide for their needs to survive. If there are any areas in your home that are incredibly cluttered, it’s good to deep clean them every once in a while and work on keeping them organized. Some of the most common spaces that you’ll have to worry about clutter in will be your garage, basement, cupboards, and pantry. All of these areas are either hardly disturbed and offer a safe space for these pests to live, or they provide them with some type of food source. By cleaning these spaces out on a routine basis, you’re minimizing clutter and catching any pest problems before they become serious. We briefly mentioned in the last point a food source could be one of the reasons that pests are drawn to your space. If you do have any exposed food in the area, this could be what is drawing pests in. If you’re noticing that there are a lot of pests in your home and it looks as though they’re getting into your food, the best thing that you can do is start to ensure your food is always in sealed containers. From dried foods to fruits and vegetables, you need to keep an eye on whether or not pests are getting into your food and if it’s extremely accessible to them in the first place. Keep as much food as you can in the fridge and ensure that all dried foods are kept in containers that make it near impossible for pests to get into. In doing so, you’ll drastically reduce the chances of pests finding a food source in your home. Completely removing pests from your home is challenging, and with how many different factors you have to take into consideration, it can be tough to determine why they’re in your home in the first place. The three points we’ve mentioned above are some of the most common reasons that pests are attracted to spaces, but they’re certainly not the only ones. If you’re still noticing pests in your home even after caring for the points that we’ve mentioned today, contact your local pest control professionals. Earthwise Pest Management strives to provide the Sacramento and surrounding areas with high-quality home pest control solutions. Contact our team today if you’re interested in learning more about how our integrated pest management method could help you with the infestation you’re dealing with. Schedule your pest control services today.